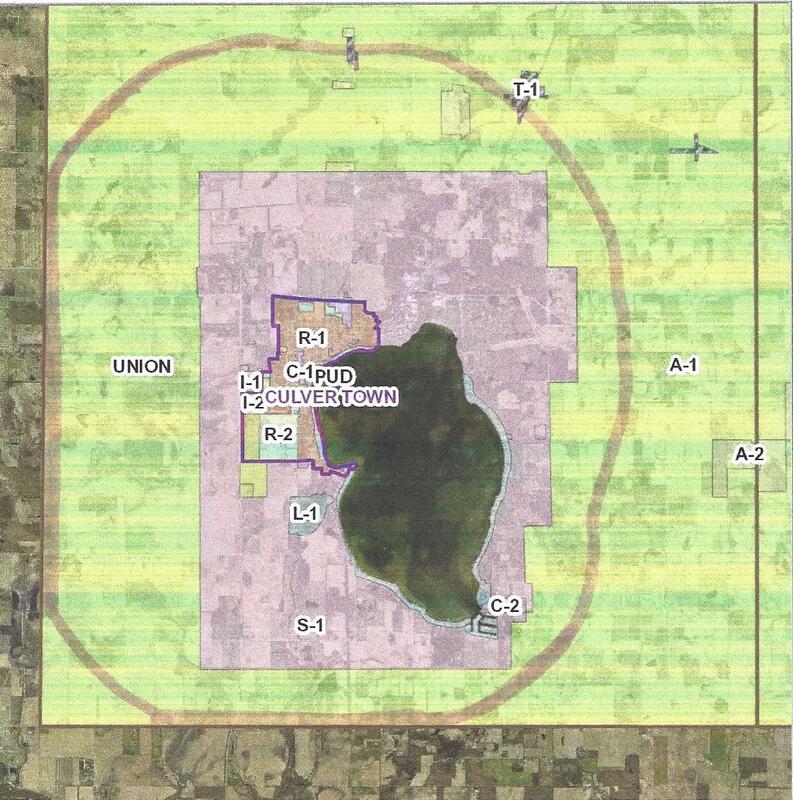 Culver’s Current Zoning Boundary in pink with the approximate 2-mile limit shown in the outer ring. When I was driving down Hwy 117 the other day I noticed that Mystic Hills has added a couple of new buildings that I’m guessing are rental cabins. I’m glad they are doing well, but I was a bit surprised to see them as I hadn’t remembered any discussion regarding a site plan revision at the Culver Plan Commission. I wasn’t sure how the mixed use had been approved. Then I remembered… Mystic Hills is outside Culver’s Zoning Boundary. It’s unfortunate, but the Plan Commission members (and me!) were fairly disheartened by the Town Council’s decision to overrule them on the wind turbine ordinance. Rightly so, they believe that this probably killed any chances of extending our territorial authority. Let me preface my next comments by saying I see nothing wrong with the additions to Mystic Hills nor do I suspect they have done anything other than follow the pertinent rules and regulations. That said, and building on the previous post, this is new development that occurred within the Lake Maxinkuckee watershed. It adds up to new impervious surface and new septic loading. We have ceded decisions on these things to the County rather than our local boards. I suspect that many of those that spoke against following the County’s lead on wind turbines don’t understand that this has led to them having less control over areas like these. The setback passed by Culver stops at the edge of our Extended Territorial Authority. Mystic Hills, sitting on one of the highest points surrounding Lake Maxinkuckee, can put up a wind turbine at the maximum height allowed by the County. It pays to understand all the implications before asking for a new regulations.